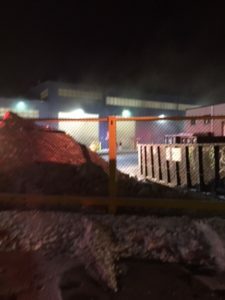 At 0046 hours, a full assignment was dispatched to Westchester Recycling Services, 13 Hayes St, for a commercial fire alarm. While enroute to the scene, PD reported smoke coming from the building. Upon arrival, responding units found heavy smoke issuing from numerous parts of the building. Entry was gained into the building, the location of the fire was determined and three lines were placed into operation. 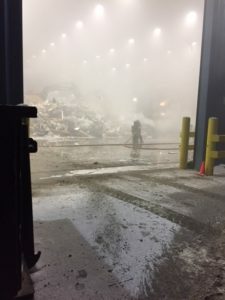 After an extended operation, the deep seated fire, which consisted a large pile of cardboard and recyclables, was placed under control. 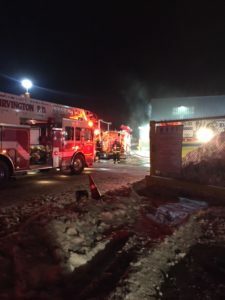 Our thanks to all of the mutual aid companies for their assistance, especially in helping to repack the hundreds of feet of hose which were deployed. At the scene: Valhalla FAST, Fairview Engine, Hartsdale Engine, Irvington Ladder, Hawthorne EMS, Cascade Unit 446, Greenburgh Medic and Battalion 18. Relocated to our quarters: Ardsley Ladder and Tarrytown Engine.